As a Los Alamos mountaineer for nearly 20 years, I had managed to deflect all previous entreaties to join the board, until Zach Baker finally caught me in a moment of weakness. The club has been both good to me and for me, and I look at this as an opportunity to give something back. My love of wild places was cultivated in the early years of my life in the woods of northern Wisconsin where my grandparents had a cabin on Butternut Lake. I spent most of the summers of my first 16 years there on the shores of that lake and in the woods surrounding it. No television and limited radio reception, led to lots of time for reading. It was during this time that I developed a vicarious interest in mountaineering through its rich literary history. The stories of summiting the high mountains are epic and I was hooked. Winters in Chicago, where I schooled, could also be epic in its own way. Waiting for a bus on a corner at 5:00 am in sub zero (F) temperatures with a 20-30 mph wind led me to imagine that I was sitting next to Maurice Herzog on his descent from Annapurna. The frost-nip in my fingers reminding me to keep my gloves close, as Herzog watches his slide down slope. I still remember my first trip into Yosemite Valley in the mid sixties. They were still doing firefalls. As I walked to the base of El Cap to look up, I remember seeing those scroungy guys pounding nails into the rock (what was that about). I was in high school when I saw the news reports that Harding and Cadwell had refused assistance from the Park Service on their way to completing the first ascent of the "Wall of Early Morning Light". While I thought that was extraordinary, my father started having serious concerns about my mental health. Shortly thereafter, I got a poster of K2 to hang in my room. It may have been with one of my initial REI membership purchases. Americans had still not stood on its summit and I was already familiar with the 1953 epic. At the time, I had no idea that I would come to know and work with George Bell and get his signature to sponsor my application to the AAC (in the days when that was still a formality). It was truly my good fortune to share that time with him, to get to know him, and hear all those marvelous stories that he could tell while we traveled to and fro. 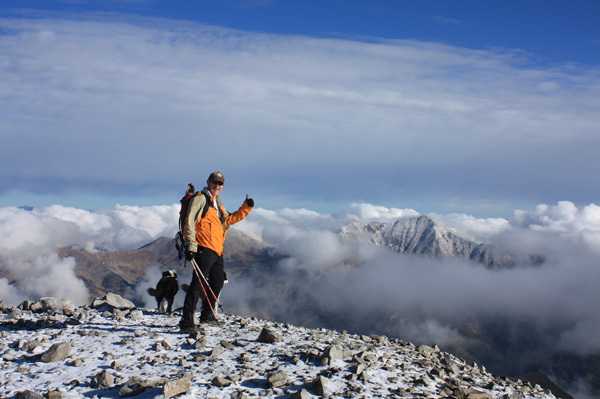 On the summit of Antero with a snow dusted Princeton in the background (2009). I summitted my first 14er in 1974 at the age of 19 after hitch hiking from Chicago to Colorado Springs. Yes, lowly Pikes Peak but it was a thrill. I am in no rush to bag them all, at 56, I only have about 20 more to go. I did my undergraduate work at Florida Institute of Technology where the high points were the causeways over the inter-coastal waterway. However, while transiting between Chicago and campus on holidays, I managed to walk about 75% of the trails and a fair amount of the bush in Great Smoky Mountains National Park, explore the caves in and around Mammoth National Park, and explore the features of Red River Gorge where I spent my first ledge bivouac. Another hitch hiking adventure in September of 1977 brought a friend and me from Florida to Colorado. We climbed Mount Elbert and Mount Harvard. On traverse to Columbia it began to snow. We made it back to camp and it snowed all night. We abandoned thoughts of completing Columbia and Yale and began our trek back to sunny and warm Florida. In 1979, I again found my way back to Colorado this time as part of a field ecology course, and this led to my first experience leading a group. On my off day I had planned to climb Longs Peak via the keyhole route. My Professor heard of my plan and asked if I would take a few of my classmates with me. The last thing that he said to me after dropping us off at the trailhead was, "bring them all back." That turned out to be non trivial. Another September, another snow squall at altitude and on Labor Day weekend with a bunch of kids from Florida. Until then, I'd never had to worry about anybody but myself. Among hundreds of climber's, I was now responsible for a dozen, and some were not making very good decisions. I did manage to get them all back, one sans photography equipment. That day forged my personal philosophy of trip leading. Simply put, objectives are secondary; the well being of every member of the party is my primary concern when leading a trip. 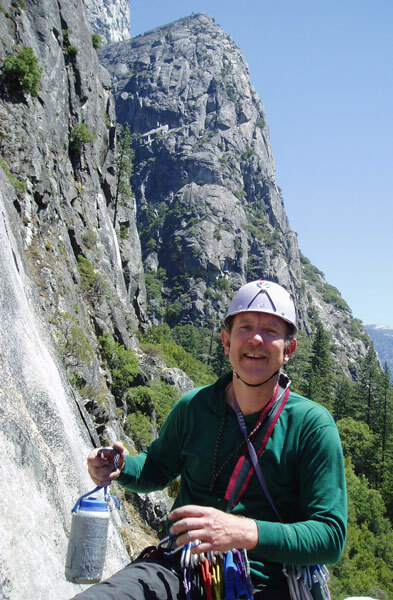 Taking the rack on the Nutcracker, Yosemite Valley (2008). While I attended graduate school at UC Davis, a short drive from the valley, my studies precluded much in the way of adventure. However, I did make several trips to Yosemite, but I would not climb there for another ten years. I did do several walk ups in the Northern Sierra and became familiar with much of their Eastern slope from Tahoe to Reno. I came to Los Alamos in 1992 after a brief foray into the biotechnology industry and a research faculty appointment at UC Irvine. I am a graduate of the 1993 climbing school directed by Stu Bowling. Rock climbing got me to some beautiful places, and although I do not climb at a high level; the ethereal feeling of watching recently released condors performing their mating ritual in flight (below me!) while sitting on a perch in Pinnacles National Monument with my son is something that I owe, in part, to the Los Alamos Mountaineers. I have climbed in the Shawangunks in NY, at Seneca Rocks, WVa,, Yosemite Valley, CA, Cirque of the Towers in the Jim Bridger Wilderness in WY, Cascades National Park in Washington State, Mount Washington in NH and many locations throughout NM and Colorado. My greatest affinity is for traditional adventure climbing and the Brazos Cliffs is a favorite place. I prefer to put skins on skis to earn a few turns to sitting on chair lifts and playing dodge the humans en piste. A couple of other memorable trips include a ski descent of Mount Adams on July 4, 2001, the 175th anniversary of his and Thomas Jefferson's death, just me and 150 of my closest friends. We also used to do thematic vacations with the family. One such adventure had us floating 165 miles down the Missouri River near the 200th anniversary of Lewis and Clarks Journey of Discovery. 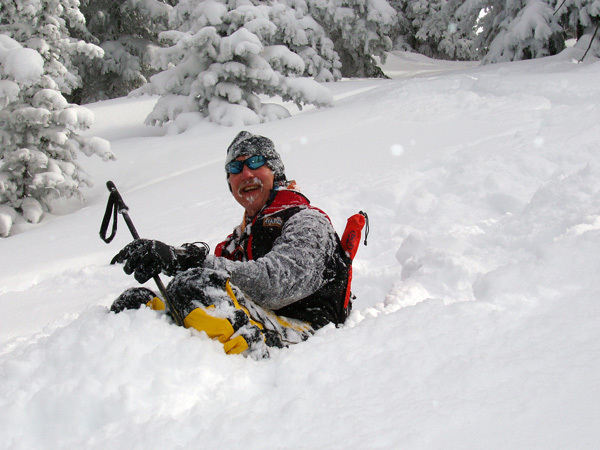 Finally, I am extremely fortunate that my wife, Michele, has shared and supported my interests in the mountains even if she is unable to accompany me on all of my adventures. My children Heather and Forest have developed similar affinities. Heather is currently serving the Nation's interests in the Peace Corp in Zambia on the African continent. I look forward to visiting her there in July of 2012 and sharing adventures with her on that continent. Forest, a recent graduate of UCSD, is an outstanding athlete with a renewed enthusiasm for climbing and is currently residing in Southern California. He longs to return to the mountain states. He is currently considering his future options. He has already found his way to the Valley much sooner than I did. One of his first leads being the Nutcracker with the old man on belay. Is this cool or what?